Shanghai China: LiveU video broadcast transmission. 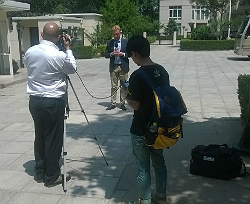 Hackensack, NJ, March 2015 – LiveU, the pioneer in IP-based live video services and broadcast solutions for acquisition, management and distribution, announced today that Shanghai Media Group (SMG), one of the largest media and entertainment companies in China, has selected LiveU’s bonding transmission technology for live broadcasts across its diverse media outlets. After conducting an in-depth evaluation of competitive solutions, SMG has standardized on LiveU’s professional, lightweight LU500 backpack for its newsgathering operations, deploying multiple units across the Group. LiveU’s technology is being supplied and supported by LiveU’s Chinese partner Diadem. SMG first leased LiveU’s technology from Diadem to cover football events, including the 2014 World Cup in Brazil, and to support the Washington news reporting division. Since then, SMG has increased its usage to cover news and sports events worldwide, including the Airshow China 2014 (the 10th China International Aviation and Aerospace Exhibition), Australian Open Tennis Championships 2015, 2015 AFC Asian Cup, 17th Asian Games in Incheon 2014, 2014 Shanghai Rolex Masters, Apple releases and Alibaba listing in the USA 2014. Mr. Gordon Gu, CEO of DiaDem Technologies Inc., LiveU’s local partner, said, "SMG is a trailblazer in China and the region in general. They're using LiveU to transmit live coverage from many different events, across different media platforms, enhancing the viewers' experience. SMG is an excellent example of how cellular bonding technology is transforming the media industry." LiveU’s global units and services are connected via the LiveU Central management system for easy preview and remote control using any computer or tablet from anywhere around the world.